Buenos Aires (Argentina) – December 13, 2018 (travelindex.com) – Unidigital is the result of the collaboration between the public and private sectors to promote innovation in tourism. It will offer services, products and training in digital transformation in order to allow the most disruptive entrepreneurs in tourism in the Americas to develop their projects. 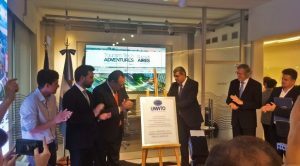 The Hub was presented as part of the UNWTO Tourism Tech Adventure Forum, held on 11-13 December 2018 in Buenos Aires, Argentina.